Tell the world of your new life in Christ with these beautiful note cards featuring John 11:25. This vibrant series by master calligrapher Timothy Botts features an exclusive watercolor butterfly in 4 rotating colors schemes of yellow, green, pink and blue. These 6 1/4" X 4 1/2" flat cards include free personalization and envelopes. 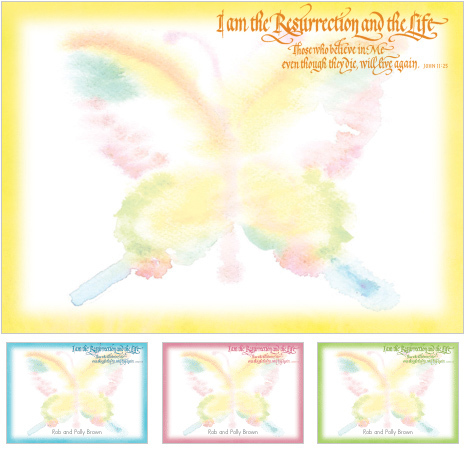 Order Resurrection cards and share the joy of a life transformed!